Homeschool Spanish Academy was founded in 2010 by Ron Fortin. As an online Spanish Academy it offers interactive lessons between native Central America instructors and students. HSA has programs for elementary, middle, and high school students as well as adults. We had the opportunity to review the middle school program when another reviewer had to drop out because of computer compatibility issues. With this review we received 7 weeks of classes (because we did not get into the program mid-June, I scheduled 2 or 3 classes a week for this review purpose). Internet ~ requires a Ping less than 100ms, Download Speeds greater than 1.0MBps, and Upload Speeds greater than 0.5 MBps. Webcam ~ optional, but highly recommended. Our computer did not pass the inspection the first time through with Ron but he was so helpful in helping guide me as far as what to say to our Internet Service Provider. Turns out my internet was way below the download speeds that I had been paying for monthly and upon talking to Verizon we were given a credit on our bill. Plus, they sent a technician out to the house the very next morning and found the problem and fixed it. Once your computer is good to go you schedule your class(es) in Schedulicity (free scheduling program HSA uses) and pick your instructor and you are all set for your class. We chose Professora Nora for our teacher and she was wonderful!!! Madison was a bit nervous but she excelled at Spanish. I speak Spanish (well the basics and enough to survive if needed) as I took Spanish 3 years in high school and 2 years in College. The very first day Madison could hold a conversation with me! Amazing! Now, my oldest daughter has been using another popular foreign language program but in my opinion HSA has them beat hands down! Professora Nora would email us Madison’s homework assignment the morning of her class, and Madison would look over it and complete it before the next class. Pricing is pretty reasonable for the one on one instruction you get. 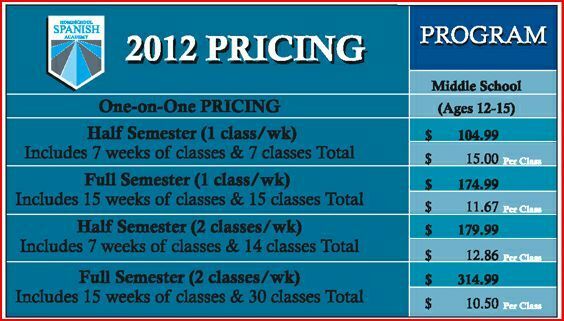 Check out the tables below for pricing information. How does this compare to a traditional public school curriculum? Our curriculum follows the same general national standard guidelines outlined by the American Council On The Teaching of Foreign Language (ACTFL). This means that we progressively cover all Spanish grammar and emphasize reading, writing, speaking and comprehension. We do however, omit a few things that public school might include, such as cultural perspective of other Spanish speaking cultures. We tend to focus on Guatemalan culture as we are experts in that, but we often give information and anecdotes to our surrounding neighbors in Central America. Will colleges and universities accept your program for college admissions? Yes! Among the colleges and universities we have spoken to, parents simply need to submit the grades of the student and a record of their completed work. HSA provides this documentation to parents if requested. Additionally, we will provide parents with an overview sheet of our curricula and teaching methodologies. Lastly, we invite all admissions offices to contact us if there are any questions about grades, work, or student abilities. Will colleges and universities accept your program for college credit? Among the colleges and universities we spoke to, they will NOT accept our program for college credit. The only credits they accept are from the AP Exam and Dual Credit courses. Love, love, LOVE it! Everything about the program. If you are looking for a conversational Spanish program in which you will actually be able to learn to speak the language then this program is for you. I will sing praises of HSA to anyone who asks! Madison is starting her formal study of Spanish in August at the start of our new school year. I am definitely going to continue with this program so she gets that one on one interaction and enroll my high schooler so she gets the proper speaking instruction too. Be sure to check out what my Crewmates had to say about Homeschool Spanish Academy by clicking on the banner below. ~~~~~~~~~~~~~~~~~~~~~~~~~~~~~~~~~~~~~~~~~~~~~~~~~DISCLAIMER: I received a half semester subscription to Homeschool Spanish Academy, in exchange for a thorough and honest review. Though I am compensated with free products, I am not compensated in the form of cash for my reviews. The opinions I have given are mine and may differ from others but are not influenced by the company or the free product provided.